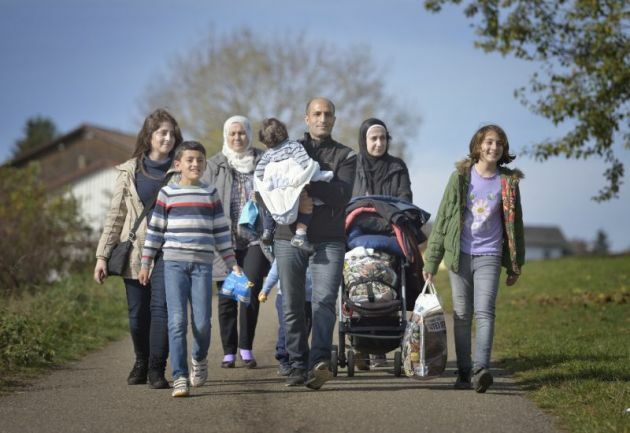 (Photo: Paul Jeffrey / WCC)Syrian refugees walk in the countryside outside Messstetten, Germany on Oct. 24, 2015. They had applied for asylum in Germany and were awaiting word on the government's decision. Meanwhile, they lived in a room in a former army barracks in Messstetten, where church groups and other community members provided a variety of hospitality. ACT Alliance, together with a range of other ecumenical actors, has issued a joint statement for World Refugee Day 2017 calling the unprecedented global refugee crisis "an opportunity to grow together." The statement calls on all of us "to build bridges of solidarity rather than walls of division" on the World Refugee Day on June 20. "Wealthy countries cannot evade their responsibility for the wounds inflicted on our planet – environmental disasters, the arms trade, developmental inequality – that drive forced migration and human trafficking," said ACT Alliance General Secretary Rudelmar Bueno de Faria. "The current levels of human displacement are unacceptable. States are bound by their commitments under international law," said De Faria whose ACT Alliance includes the World Council of Churches and the Lutheran World Federation. These include the Refugee Convention and commitments outlined in last year's New York Declaration on large movements of refugees and migrants, to fulfill obligations made. These come as "the world community works towards agreeing on new global compacts on refugees and on migration in 2018." In their statement the ecumenical groups refer to the story in the Christian Bible that tells the story of two men, Peter and Cornelius, utterly divided by religious belief and culture. While encountering each other they discovered a truth about God's common will for them that neither had previously grasped. "They learnt that the Holy Spirit brings down walls and unites those who might think that they have nothing in common. "All around the world, women, men, and children are forced by violence, persecution, natural and human-caused disasters, famine, and other factors, to leave their homelands," says the statement. "Their desire to escape suffering is stronger than the barriers erected to block their way. The opposition by some countries to the migration of forcibly displaced people will not keep those who undergo unbearable suffering from leaving their homes." De Faria said wealthy countries cannot evade their responsibility for the wounds inflicted on our planet – environmental disasters, the arms trade, developmental inequality – that drive forced migration and human trafficking. "While it is true that the arrival of migrants in more developed countries can present real and significant challenges, it can also be an opportunity for openness and change. "Societies that find the courage and the vision to go beyond the fear of foreigners and migrants soon discover the riches that migrants bring with them, and always have," said De Faria. He said if people insist only seeing refugees as a burden, they deprive ourselves of the opportunities for solidarity that are always opportunities for mutual learning, mutual enrichment, and mutual growth.